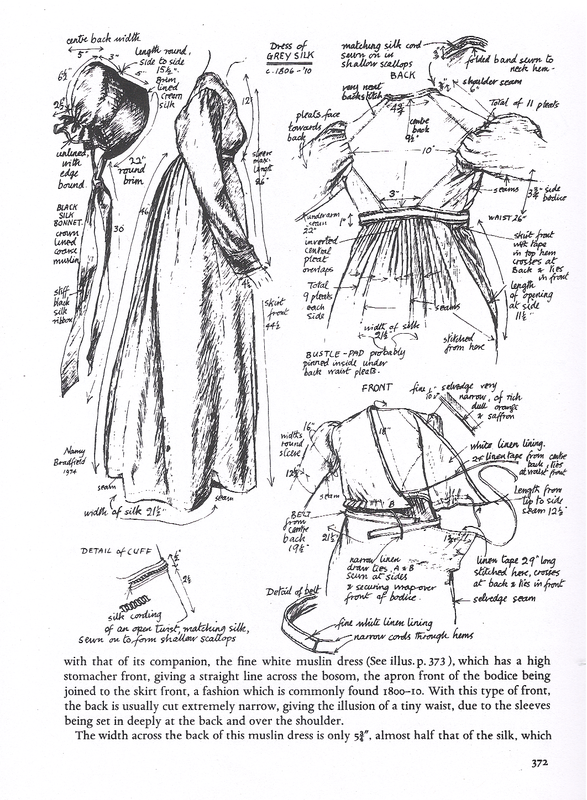 Costume in Detail by Nancy Bradford, page 372. I’m still struggling with the Quaker Dress conundrum, both because I want a challenge and I want to be as accurate as I can be. So, not unlike my stubborn cat, I got an idea, and I just can’t shake it. The kind-of-cross-over, apron-front, v-neck day dress. I’ve tried and failed before, but I got a little farther Saturday. When I went looking for the original, I was pleased to find that it had ended up at Killerton House, as part of the National Trust Collection. You can find it here, but you can’t see it yet. I think it may look something like the dress in this portrait, but without the collar. We’ll see… the next trial will be a drawstring, just to see if I can get this business to fit. It’s better on a human than on a hanger. 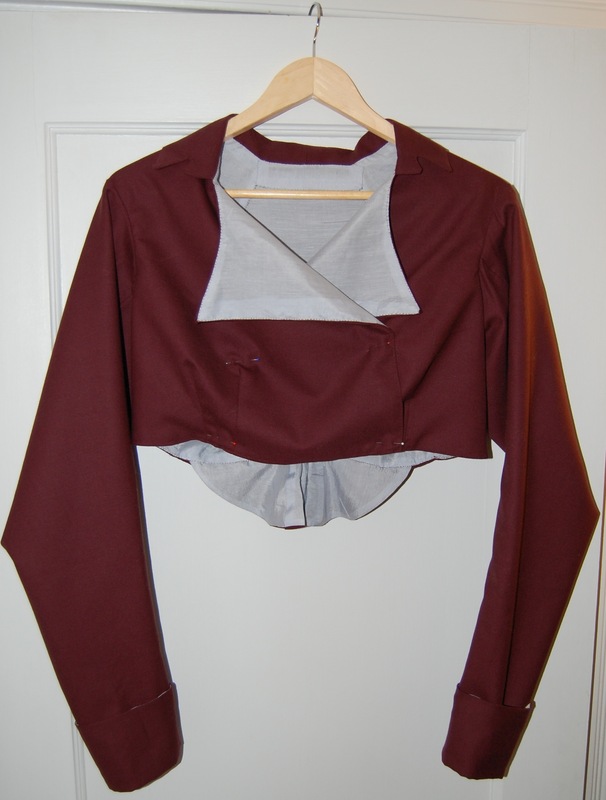 I’m close to being finished– all that remains are closures, but the sewing is done. It fits, though I haven’t yet tried it on over stays. It looks less wretched in the mirror than it does on a hanger, I will give it that. The wool is a yard and a quarter worsted remnant, and while it has a nice hand, it was sometimes annoying to press. It may have been the fault of the silk, though; I used a very light weight silk–even lighter than Booth’s “persians”– and that was probably a mistake. 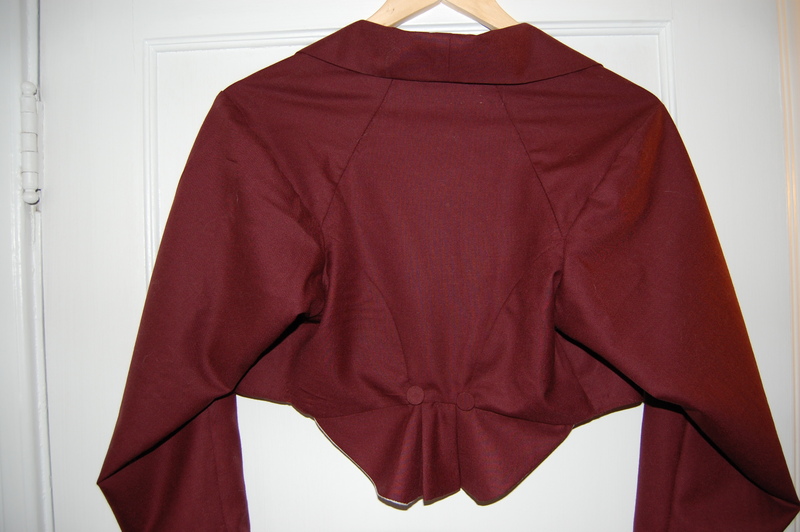 Last-minute peplum and button additions.